Recently, Farmers National Bank presented a check for $2500 to the Elk County Community Foundation (ECCF) from their Educational Improvement Tax Credit Program (EITC) approved donations. These dollars will be used to provide local school districts or agencies that serves Elk County School students K-12 with pre-approved innovative educational programs for the upcoming 2019 grants. Any entity authorized to conduct business in the Commonwealth of Pennsylvania and subject to certain taxes is eligible to apply to be involved with the EITC program. Tax credits are limited to 75% of the business’ contribution with a maximum of $750,000 annually. If a business agrees to make the same contribution for two consecutive years, it may receive a tax credit equal to 90% of its contribution. Interested participants must submit a brief application to the DCED. More information about applying can be found at https://dced.pa.gov/programs/educational-improvement-tax-credit-program-eitc. As an approved EITC partner the Foundation receives donations from qualified businesses to provide innovative educational programing with in the public schools K-12. Paula Fritz Eddy, on left, Tom Jesberger, on the right and Fritz lecker to the left of Aiello all from the Community Foundation accepted the check from Barb Donahue, Branch Manager of the St. Marys Branch of Farmers National Bank. 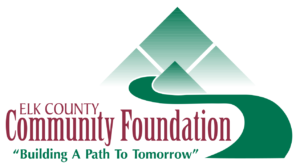 For more information about the Community Foundation or EITC opportunities contact Paula at 814-834-2125 or visit their website at www.elkcountyfoundation.org .